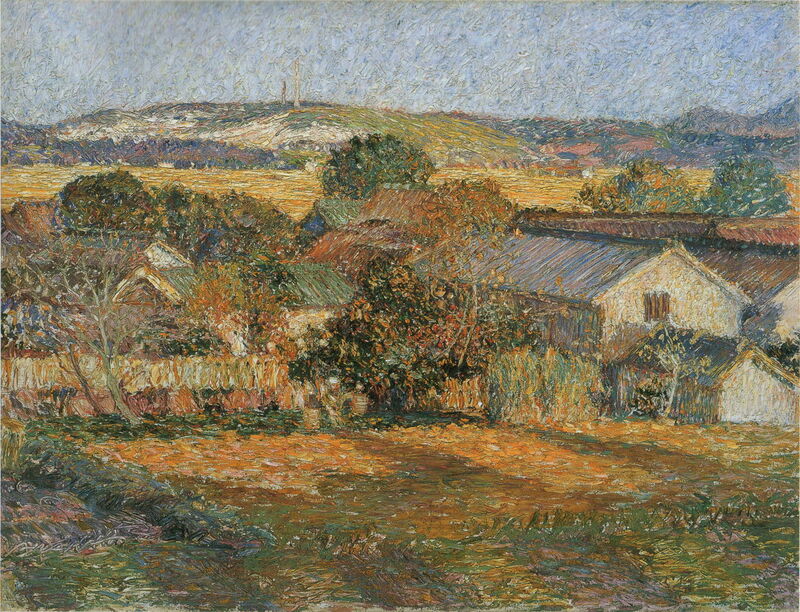 Torajirō Kojima 児島虎次郎 (1881–1929), Summer in Asahikawa 旭川の夏 (1913), oil on canvas, 66 x 81.5 cm, Ōhara Museum of Art 大原美術館, Kurashiki, Japan. Wikimedia Commons. The art museums and galleries of Japan have not only superb collections of traditional East Asian art, but many masterpieces of Western art. 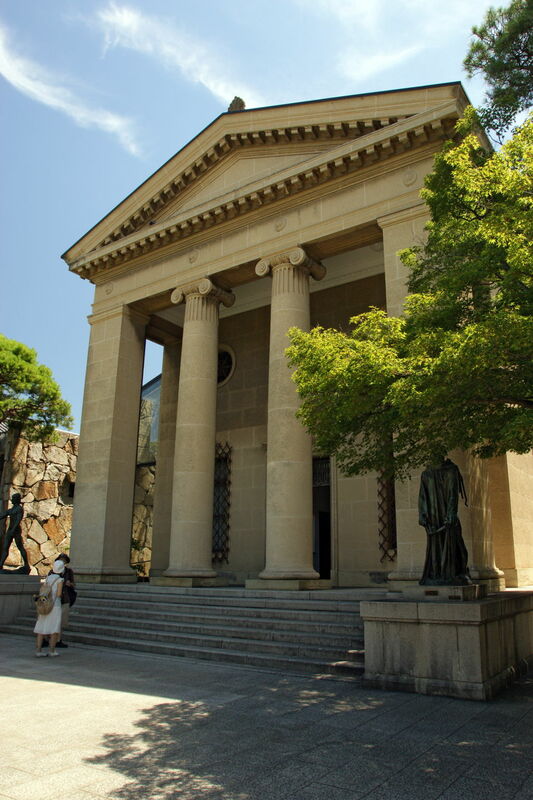 The first collection of Western art to be permanently exhibited in Japan is that of the Ōhara Museum of Art 大原美術館 in Kurashiki, in the south of the country, on the northern coast of its Inland Sea. Ōhara Art Museum in Kurashiki, Okayama prefecture, Japan (2008), image by 663highland, via Wikimedia Commons. It opened its doors to the public in 1930, and was founded and funded by local banker and industrialist Magosaburō Ōhara 大原 孫三郎 (1880-1943). Ōhara was advised by, and patron to, the Japanese Impressionist Torajirō Kojima 児島虎次郎 (1881–1929), whose paintings hang among those by El Greco, Pissarro, Monet, Renoir, Gauguin, Picasso, Bonnard, and other famous artists. The Ōhara Museum was a patron’s ultimate honour for the life and work of his friend, Kojima. Kojima came from modest origins in Shimohara village in Okayama prefecture, now part of Takahashi City. When he was 20, in 1901, he decided to go to Tokyo to study art, and the following year started at art school there, in what is now the Tokyo National University of Fine Arts. At that time, painting in Japan was divided into ‘western’ and ‘traditional’ branches, and Kojima chose the former. He was awarded sponsorship as a scholar, funded by the Ōhara family of Kurashiki, which started their long and fruitful association. Kojima was highly talented, and graduated in 1904. He then spent four years developing his skills in Japan. Torajirō Kojima 児島虎次郎 (1881–1929), Watermill in the Village 里の水車 (1906), oil on canvas, 87 x 141 cm, Ōhara Museum of Art 大原美術館, Kurashiki, Japan. Wikimedia Commons. His early paintings from this period are not at all Impressionist: Watermill in the Village 里の水車 from 1906 is a good example of the social realism which he initially adopted. In 1908, thanks to the continuing support of Magosaburō Ōhara, who was the same age, Kojima travelled to Europe to study. Torajirō Kojima 児島虎次郎 (1881–1929), Make-up 化粧 (1908), oil on canvas, 80.5 x 65 cm, Ōhara Museum of Art 大原美術館, Kurashiki, Japan. Wikimedia Commons. His Make-up 化粧 from 1908 shows the radical change in style which occurred. 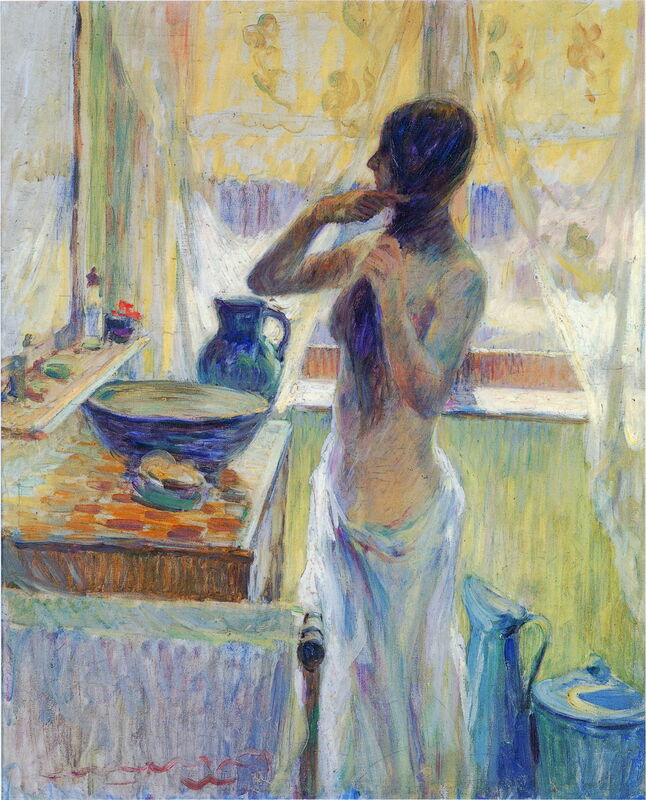 This has the look of one of Pierre Bonnard’s bathroom nudes, with a very painterly facture. The following year (1909), Kojima started studies at the Academy of Fine Arts in Ghent, Belgium. 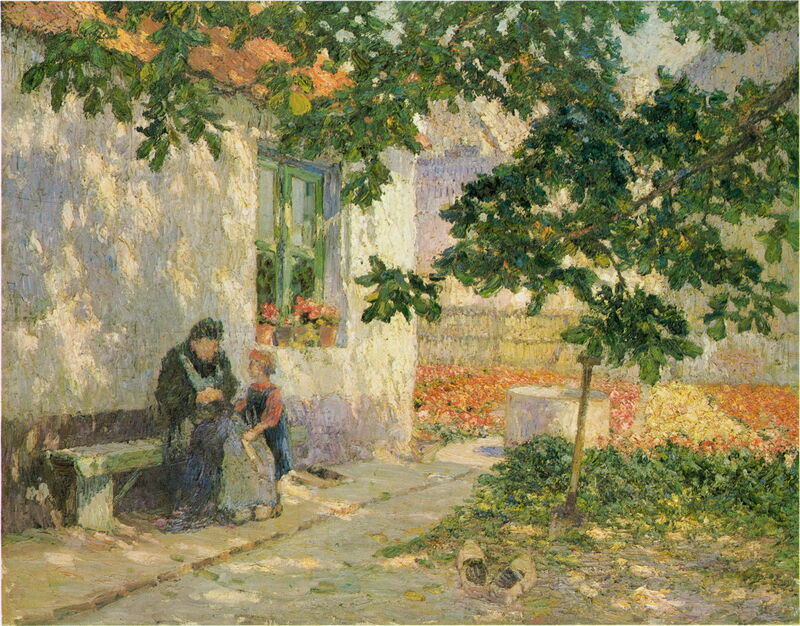 Torajirō Kojima 児島虎次郎 (1881–1929), Garden of Begonias ベゴニヤの畠 (1910), oil on canvas, 91 x 118 cm, Ōhara Museum of Art 大原美術館, Kurashiki, Japan. Wikimedia Commons. His Garden of Begonias ベゴニヤの畠 from 1910 is something of a ‘puzzle picture’. As a young girl talks to an older woman, there’s a spade stuck in the ground and a large empty pair of clogs nearby. There is no sign of the wearer of the clogs who has presumably been digging the ground there. 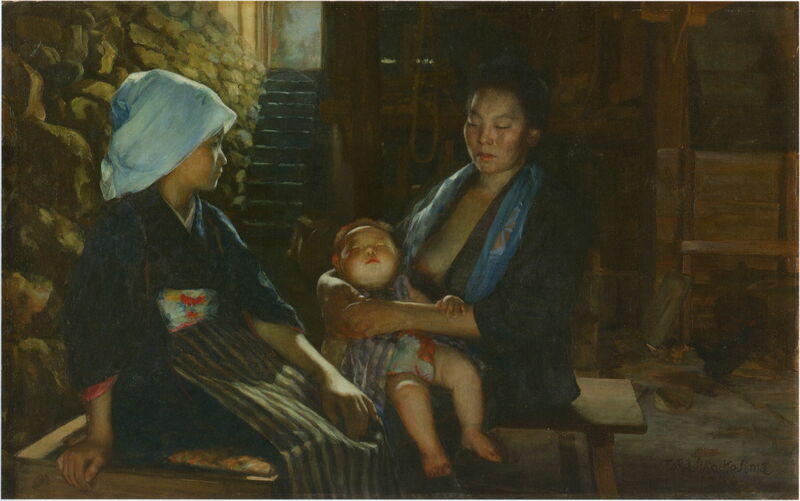 Torajirō Kojima 児島虎次郎 (1881–1929), Sisters 姉妹 (1911), oil on canvas, 162 x 114 cm, Ōhara Museum of Art 大原美術館, Kurashiki, Japan. Wikimedia Commons. Sisters 姉妹 from 1911 is set in a thoroughly European location, probably a verandah in a Belgian town. 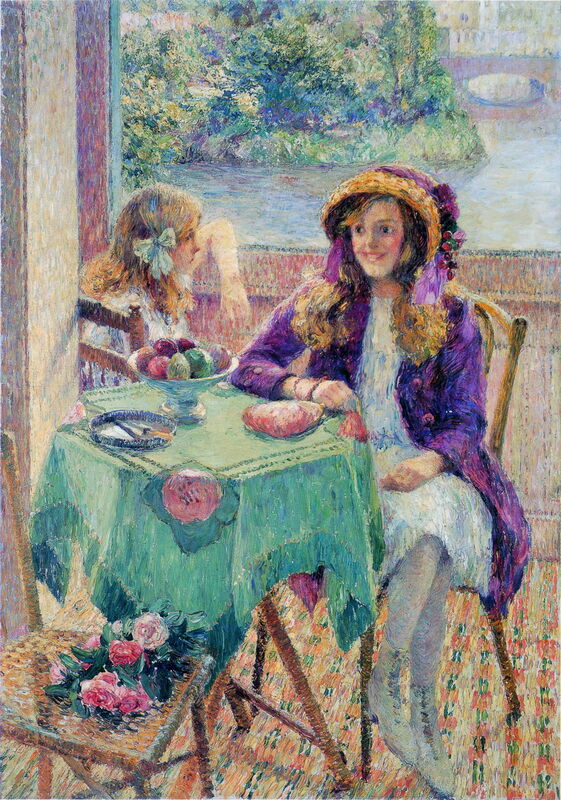 Two young sisters are talking, one of them wearing a richly purple coat with matching hat. 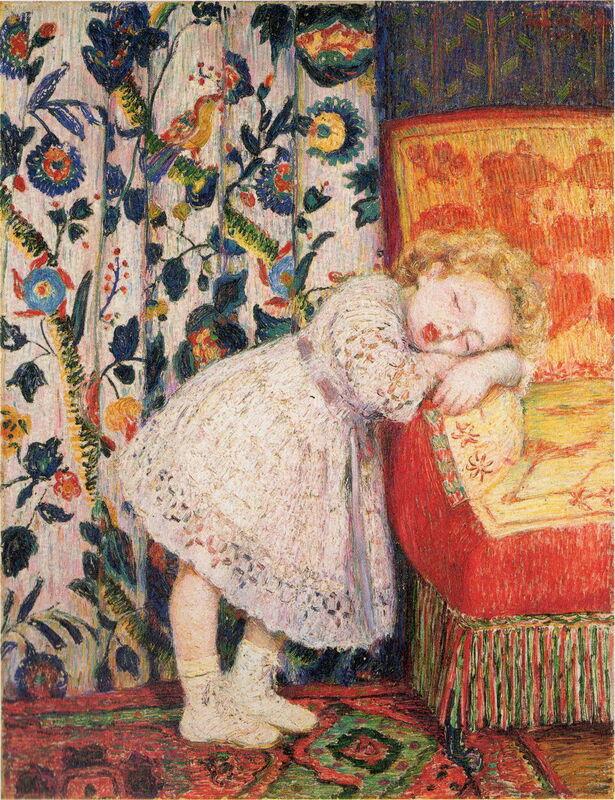 Torajirō Kojima 児島虎次郎 (1881–1929), Sleeping Young Model 睡れる幼きモデル (1912), oil on canvas, 116.2 x 88.5 cm, Ōhara Museum of Art 大原美術館, Kurashiki, Japan. Wikimedia Commons. Kojima’s figurative work is superb, and in Sleeping Young Model 睡れる幼きモデル from 1912 he also excels in the delicate detail of its patterned fabrics, in the drape behind the girl, the upholstery of the armchair, and the carpet. In late 1912, Kojima returned to Japan, having successfully completed his studies in Ghent. Summer in Asahikawa 旭川の夏 from 1913 shows a busy beach scene in the summer, which I suspect is in southern Japan. However the city of Asahikawa is inland on the northernmost island of Hokkaido. Kojima imparts marvellous textures to the beach and water. Kojima travelled to China and Korea in the following years. His patron, Magosaburō Ōhara, started to invest in fine art, and Kojima returned to Europe to purchase paintings which now form the Western collection of the Ōhara Museum. Torajirō Kojima 児島虎次郎 (1881–1929), Portrait of Ōhara Magosaburō 大原孫三郎像 (1915), oil on canvas, 81.5 x 65.5 cm, Ōhara Museum of Art 大原美術館, Kurashiki, Japan. Wikimedia Commons. 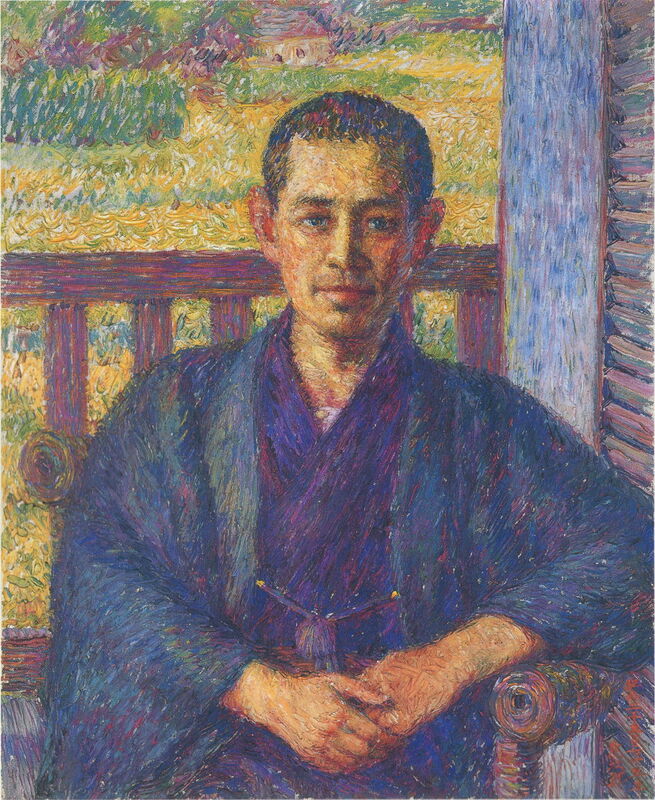 Portrait of Ōhara Magosaburō 大原孫三郎像 (1915) shows the industrialist at the age of 35. 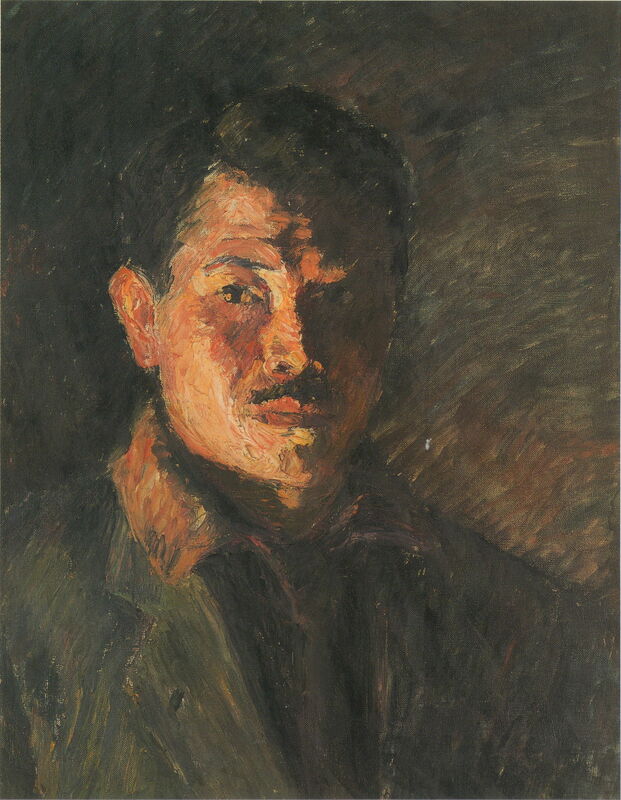 Torajirō Kojima 児島虎次郎 (1881–1929), Self-Portrait 自画像 (c 1917), oil on canvas, 56.5 x 44.5 cm, Ōhara Museum of Art 大原美術館, Kurashiki, Japan. Wikimedia Commons. For his own Self-Portrait 自画像 in about 1917, Kojima opts for more dramatic, almost chiaroscuro, lighting, which makes him look older and more anxious. Torajirō Kojima 児島虎次郎 (1881–1929), Autumn in Sakatsu 酒津の秋 (1917), oil on canvas, 87.5 x 115 cm, Ōhara Museum of Art 大原美術館, Kurashiki, Japan. Wikimedia Commons. Autumn in Sakatsu 酒津の秋 from 1917 shows the countryside and small farms near Kurashiki. 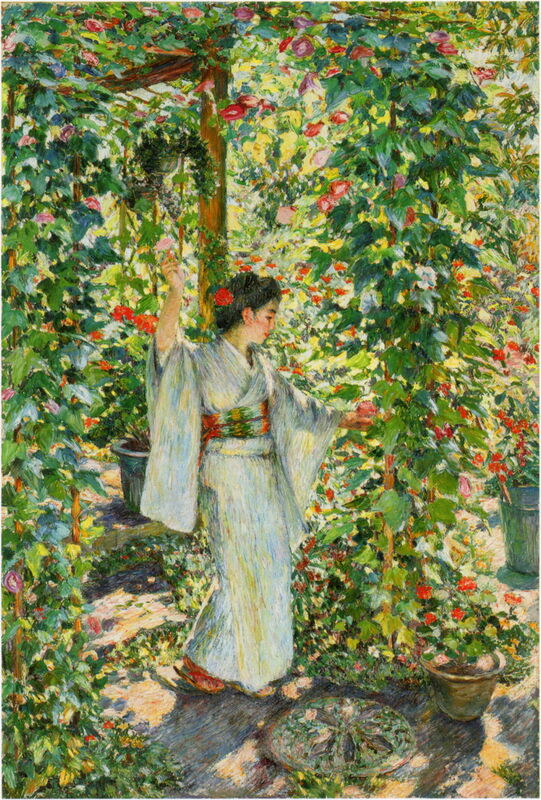 Torajirō Kojima 児島虎次郎 (1881–1929), Morning Glories 朝顔 (1916-20), oil on canvas, 197.2 x 131.5 cm, Ōhara Museum of Art 大原美術館, Kurashiki, Japan. Wikimedia Commons. Morning Glories 朝顔 is one of a pair of paintings which Kojima made between 1916-20, most of their canvas being broken by the brilliantly-lit foliage and flowers, making them appear almost Divisionist. Torajirō Kojima 児島虎次郎 (1881–1929), Landscape in Spain スペインの風景 (1920), oil on canvas, 57.5 x 70 cm, Ōhara Museum of Art 大原美術館, Kurashiki, Japan. Wikimedia Commons. 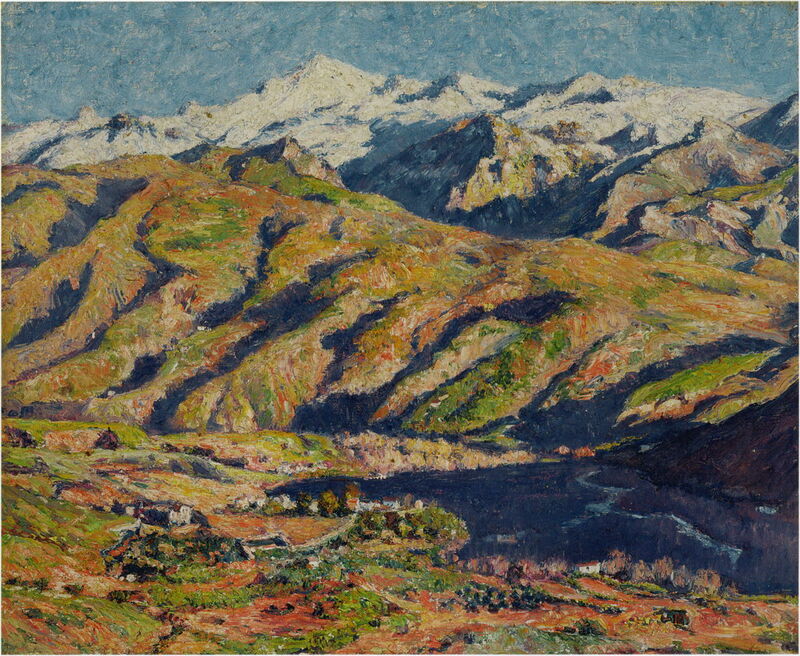 Around 1920, he appears to have visited Spain, where he painted the Alhambra, and this wonderful view of a mountainous Landscape in Spain スペインの風景. Torajirō Kojima 児島虎次郎 (1881–1929), Tower in Suzhou 蘇州の塔 (1924), oil on canvas, 68 x 57 cm, Ōhara Museum of Art 大原美術館, Kurashiki, Japan. Wikimedia Commons. 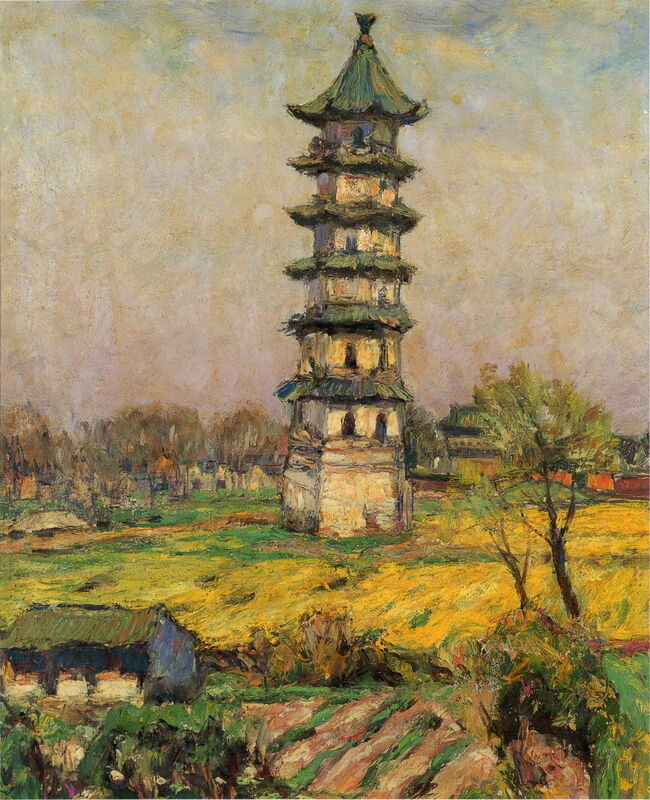 In 1924, he must have have visited the area around the city of Shanghai in East China, where he painted this Tower in Suzhou 蘇州の塔. This too is something of a puzzle: Suzhou is famous for its ‘leaning pagoda’ on Tower Hill, but that is a much more substantial structure than this more modest pagoda. That year, Kojima was commissioned to undertake his largest and most important work, a mural for the Emperor. Soon after starting on it, though, he fell ill. His health steadily declined, and he was unable to complete the mural. He died in 1929. The following year, the Ōhara Museum of Art opened its doors to the public, and in 1934, his mural was completed by a friend, Yoshida Bract. It is now in a museum attached to the Meiji Jingu Shrine in Shibuya, Tokyo. Kojima’s paintings are now exhibited in his own Memorial Hall at the Ōhara Museum – a tribute to a great friendship between painter and patron. 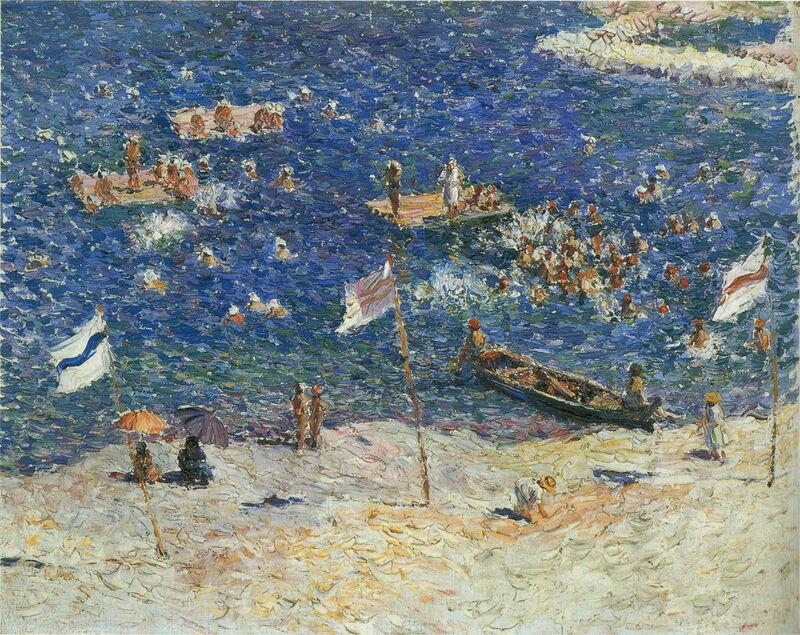 Posted in General, Life, Painting and tagged Impressionism, Japan, Kojima, painting, Post-impressionism, Torajirō, Ōhara. Bookmark the permalink. Kurashiki has an interesting history and connection to England. Most of the land was reclaimed from the sea during the Edo but unfit for rice production. The local merchants planted cotton instead and developed the area into a thriving one. In the Meiji Kurashiki built one of the first modern cotton mills with technology and looms imported from England. The mill is now a museum with the original English looms on display. From this grew the Ohara and Kuraray (Ku as in Kurashiki) fortunes. The well preserved historical district in which the Ohara Museum of Art is located is well worth the visit. Thank you so much for that fascinating information: although I have been to Japan, I didn’t get as far south as that. But it is on my list for when I get a chance.